Our Weber Genesis E-310 review looks and the pros and cons of this gas grill model – and discusses the features it has…. and those it does not! Our research also examines the current models available on sale, so you can find the best price to suit your budget. It’s obvious from our research that the Genesis range created by Weber is a popular set of grills. The Weber Genesis E310 gas grill is currently the lowest priced model in the Genesis range. However, this does not mean that it lacks features, and there are owners all over the globe who sing its praises. The Weber Genesis E-310 gas grill looks great, comes in both lp liquid propane and natural gas options, and helps make those outdoor grilling moments full of delicious memories. If you are cooking for twenty, or just you and your partner, the Weber Genesis E310 gas grill will surely handle whatever you throw at it. The Weber Genesis E 310 gas grill was designed with durability and quality in equal measure. You have a choice of colors in Black 6511001, Copper 6512001, Green 6517001, or Stainless Steel. 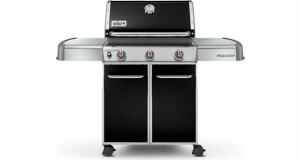 If you want the stainless steel model you will want the Weber Genesis S-310 Gas Grill. Whatever color you choose, you’ll be proud to show your grill to all of your family and neighbors – it will certainly be a welcome feature on your porch, or in your yard! Look after the Weber Genesis E-310 grill and it’ll look after your grilling needs for many years! The Weber grills in the Genesis series are reputed for their solid design and great build quality. Weber are truly a global company, distributing their products out of their US base across the world. Online discussion boards are packed with Weber grill fans talking about their love of all things Weber. The Weber Genesis E310 gas grill has arrived! As is typical of most grills of this size, some home assembly of your new grill is required. The Genesis E310 gas grill is accompanied with full instructions. Should you need extra help you can get in touch with Weber through via telephone or the web, 24/7. Indeed, there are videos to help you on your way too. Happy customers report successful construction of their grill within a couple of hours, and are immediately pleased with the beautiful bbq they have just put together. It is worth noting that the grill can weigh close to 170lbs, and therefore it’s advised you construct your grill very close to where you intend to use it. However, the advantage of this weight is that grilling on this bbq gives the chef lots of re-assurance through its robust positioning and build. And remember, Weber’s support team are not just there for when you first build your grill. They are there for all of your questions throughout your ownership of your grill. Weber show you so love by throwing in their cookbook inside the grill packaging box. Overall, the Weber support services provide the buyers of their grills complete peace of mind. Certainly for us, Weber are the only grill company we could find that’ll give you 24/7 support. Is the Genesis E-310 Grill worth the investment? The Genesis grill series is from Weber’s mid-range, mid-priced offerings (the Summit series is the top of the range, and the Spirit series is their lowest of their ‘standing’ grills). While there may be other brands offering cheaper grills, the hoards of customers, and continuing buzz around a Weber grill, seems to indicate you get what you pay for. Look after the grill and customers report some models lasting them over 10 years. Need to cook for many guests? Fast? 30 Burgers can fit on this Genesis E-310 Grill ! 637 sq inches in provided by the Genesis E-310 gas grill. The surface area (507 sq. inches cooking area+130 sq. inches warming area) gives flexibility and versatility to pretty much cook anything you can think of. 38,000 BTU per hour is offered through 3 burners. (1 BTU is approximately equivalent to the heat from 1 wooden match burning), so you can imagine the options the 38,000 BTU provides. As for any grill with burners, regular cleaning is required to keep them operating and functioning efficiently. The grates, which are cast-iron with a porcelain-enamel, distibute their heat evenly. This feature again gives the chef enhanced control over the food being cooked, and indeed provides those seared marks on the finished product with great satisfaction! 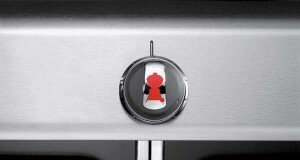 If that’s not enough control, each burner is highly adjustable through the control knobs. These controls are conveniently located on the front of the grill (as opposed to the side on some other brands), which enables the chef to quickly adjust the heat as required. Once you have completed cooking, or need to gently warm your food, the 130 sq inches of warming rack above the cooking grate is very handy. The Weber Genesis E310 grilling area is surrounded either side by 2 nicely sized preparation areas. If you are seeking a side burner option for your grill to warm those sauces, you will need to have a look at the next model up, the Weber Genesis E-320 gas grill. The lid of the Weber Genesis E-310 gas grill feels large and solid, and when closed retains the heat, and keeps those smokey flavors within the grilling area. You can monitor the temperature at all times using the thermometer which is located on the front face of the lid. The thermometer is standard for all models within the Genesis range. 3-2-1 ignition…the Genesis E-310 Grill lights up! 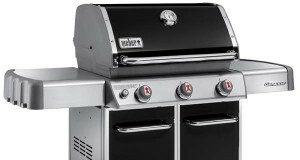 The Weber Genesis E-310 gas grill ignition system is via a front mounted push button, firing up the gas burners electronically. This is great for a quick start up, saving the need to hunt for matches or a lighter! The amount of fuel used as you cook is easily monitored using the precision fuel gauge indicator located within the cabinet enclosure. This feature is available for both the natural and lp liquid propane models of the Weber Genesis E310 gas grill. No? We don’t either! It surely makes sense with an investment in this quality grill to keep the dust off it, and protect it from everything the weather has to throw at it. To maintain it in pristine condition, we therefore recommend the purchase of the tailored Weber Genesis 7553 Grill Cover. 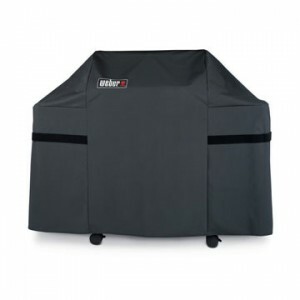 This is a specifically designed cover to snugly fit your lovely Weber Genesis E-310 bbq. The cover will avoid having to clean your grill in a panic just before your guests turn up in your yard too! Like to roast your meats? You can roast with the Weber Genesis E 310 gas grill because you have the option of purchasing a 7519 Weber Grill Rotisserie Spit. The spit comprises 2 forks which are split. The rotation is provided by a powerful motor. This means you can place whole chickens or large cuts over the grill to get that excellent rotisserie result. 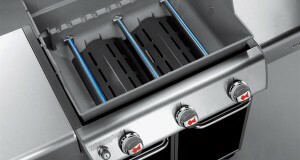 The mid-range, mid-priced Weber Genesis grills are packed with quality design features. The Weber Genesis E310 grill, with both liquid propane or natural gas options, means that cooking with its 3 burners, & surface area of 637 sq inches is a joy. The 2 preparation tables to the side of the grilling area, and lid with thermometer, provide what most grillers will be looking for. 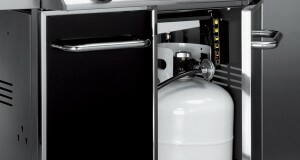 A housing cabinet to hide the fuel source comes as standard, and the solid feel of the Weber Genesis E-310 gas grill will leave you thinking you’ve made a great choice for your grilling needs.